There were 27 press releases posted in the last 24 hours and 153,147 in the last 365 days. Cancer is as unique as each of the affected body tissues and the person who faces it. Cancer is as unique as each of the affected body tissues and the person who faces it. Therefore, Dr. Susana’s mission is to help you improve your condition by providing you with additional educational knowledge that will help you reinforce your immune system to fight cancer. Because it is a long process, and more of a sustained effort on many levels of your awareness you must incorporate a wise and very detailed strategy to overcome the inner conflicts and frictions that are debilitating your immune system, which is your vital force. To heal from an advanced cancer, you need to regain as much energy as possible from all the aspects of your life. It requires inner reassessments in order to regain optimal health and functioning. For example, one benefit of brown seaweed nutrition is the Fucoidan content. Fucoidan is another much needed natural ingredient to help with energy levels, and contributes to a reduction in tiredness and fatigue. As for what I consider to be the physical supplies, the basics are: good clean food, water, air, sunlight, shelter, meaningful work and relationship to the human community and rest. In recent years, many compassionate suppliers and professionals have been helping to improve the quality and availability of these basics. Since the most effective tools for improving health are often concentrates of foods or minerals, and many powerful therapies apply specific forms of these other provisions for health, I count myself among that group. Specific protocols for different cancers are as complex and multifaceted as the caring professionals who devise them. Every year alternative-minded healers have grown in sophistication and effectiveness. · The toxic chemicals that enable much of our modern lifestyle are often found to have slight hormonal effects, and these are usually estrogenic. A comparison between the effects of estrogen on any vertebrate and the effects of a malignant cancer would highlight many parallels. · Cancer thrives in a glycolysis environment, where the energy it needs is produced from the breakdown of sugar. Cancer declines or fails to thrive when cellular respiration is primarily the oxygen-rich metabolic event known as the Krebs Cycle. · Chronic sustained stress and trauma to a cell, tissue, or organ will dramatically increase the likelihood of a cancer. This stress might be mechanical, chemical, or energetic. Chronic excesses of poor nutrition or deficiencies of necessary nutrients have caused this sustained stress and trauma for much of humanity and its history. · Re-establishing the parameters of healthy balance, which our ancestors described as “aligning with natural law,” will enable any living being to recover from disease and regain health; that is, if there is reasonable time and vital energy to work with. · When a cancer is diagnosed, the energetics of health for that person and the affected tissue should be understood by the diagnosing provider. · The physician or health professional who diagnoses cancer should also explain these factors to patients and family members who are concerned. If this is not your experience with cancer treatment, keep looking. Below I am attaching a partial list of some natural ingredients scientifically proven to help manage common symptoms associated with anaerobic disorders. These include ingredients that can support the immune system to control the side effects caused by the treatments. 1. NatureMedic™ Fucoidan powered with AHCC®—This innovative product contains Fucoidan extracted from brown seaweeds, which contribute to apoptosis within the cancer cell according to reports from Japanese and Russian researchers. Other effects most noted are the protection of the patient’s digestive functions and alternative benefits for the thyroid metabolism. It also contains a healthful ingredients known as AHCC® (Active Hexose Correlated Compound) to more widely support the immune system and antioxidant activity in people who consume it as directed. What makes this brand different for other Fucoidan brands? From the idea to the finished product, this dietary supplement is considered a premium brand. NatureMedic™ Fucoidan was optimized with AHCC® to support and improve the Quality of Life of many people. This brand uses TWO species to extract the Fucoidan from: MOZUKU AND MEKABU (WAKAME). NatureMedic™ Fucoidan powered with AHCC® contains CERTIFIED ORGANIC FUCOIDAN extracted from the MEKABU SPORES. This means that you do not have to question the fact that these products might be contaminated. ​Besides Fucoidan, it also contains two mushroom extracts: Agaricus blazei Murill and AHCC® (Active Hexose Correlated Compound). 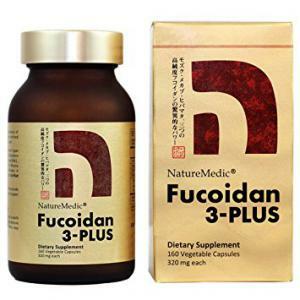 Fucoidan powered with AHCC® is an exclusive and innovative blend that combines high-quality Fucoidan extracted from Okinawa Mozuku and Australian Mekabu Fucoidan. This unique combination contains AHCC®, a cultured mushroom mycelia extract that is rich in alpha glucans. 2. Iodine—This is a remarkable “smart mineral” which has been widely known as deficient in most Americans for many years. This form is a well-studied and absorbable form of Iodine, and it’s another affordable and effective support for complex conditions of metabolic imbalance. 3. DIM—Di-Indoly Methane (DIM) is a gift from the cabbage plant family that is proven to help the liver metabolize estrogens into beneficial byproducts. 4. Calcium D-Glucarate—This is a highly absorbable version of Glucaronic acid, which helps the liver with Phase 2 detoxification tasks–the specific pathway most challenged by complex petrochemicals and pollutants. 5. Vitamin D3—This “sunshine” vitamin is extensively referenced in medical literature as being protective of blood calcium levels. It is also proven to contribute to the protection of hormone levels in the blood, as well as the defense against some cancers. The many various cancer types and locations require specific support for their respective organ functions and protection from stress. This support can be achieved by the intelligent use of many natural foods and products.